Hi! 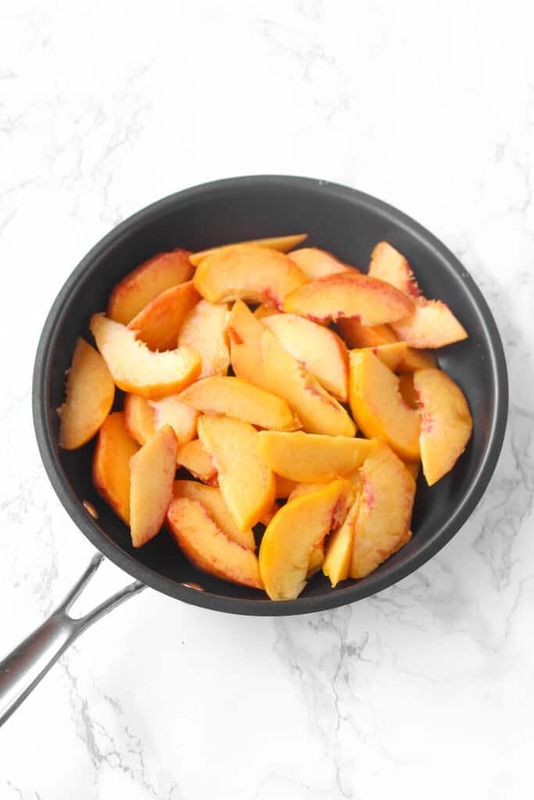 I’m popping in today to share a recent favorite way to enjoy peaches– cooked in a skillet with just a splash of water and some cinnamon. The fresh peach slices get caramelized and end up even juicier than before. Then, you can serve the warm cinnamon skillet peaches with a little bit of fresh whipped cream or coconut cream, or use them as a topping for vanilla ice cream. The “technique” is so simple that I don’t know if I can even call this a recipe. But, it is a healthier way to satisfy that after-dinner sweet tooth when you’re in the mood for something fruity and healthy. I do something similar with apples in the fall and winter. When it comes to desserts, I’m usually much more of a chocolate girl. I’ve never once called a chocolate mousse or cake or soufflé too rich, and the darker the chocolate, the better. But I think it’s a lot harder to make delicious, truly healthy chocolate desserts, so if I am trying to make a healthy option, I’ll make something with fruit instead. Still good, and maybe less likely to make your teeth hurt, although I think there’s a time and place for truly decadent desserts, too. 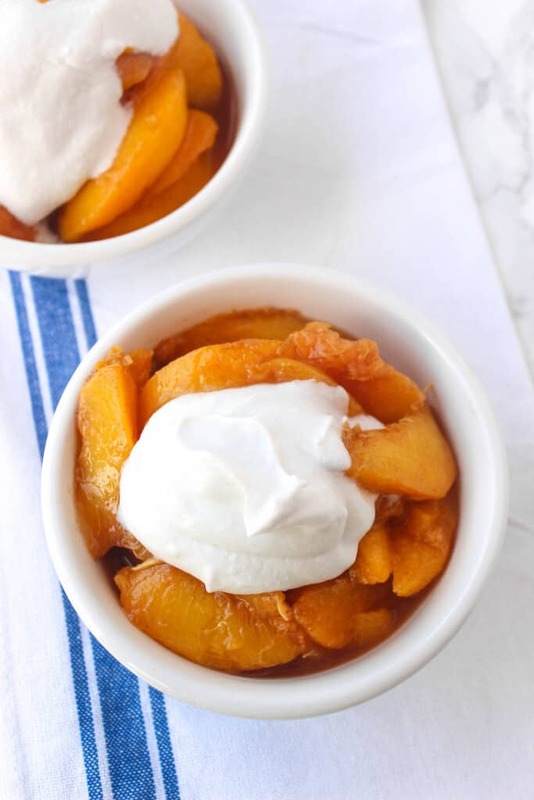 These skillet peaches taste a lot like peach cobbler or peach pie filling and are perfectly sweet even with no added sweeteners. There’s no crumbly topping involved, but if you wanted, you could substitute peaches in this healthy mixed berry crisp recipe and I bet it’d be delicious. I was afraid I might be a little too late in the summer to post this peach recipe, but I read a New York Times article a few days ago (“When is Peach Season? It’s a Bit Fuzzy“– I had to include the cute title) in which one food writer recommended waiting to eat peaches until after the 4th of July. Starting then, she says, you have about 6 weeks of good peach-eating ahead of you. That means we have at least 3 more weeks of delicious peach-eating in front of us, until mid-August or so. Thank goodness, because I’ve only eaten a few so far this summer, and I have a lot of catching up to do. How sad would it to have missed peach season all together? So, don’t let peach season pass you by– make your favorite cobbler or skillet peaches, or enjoy some fresh, whole peaches before it’s too late! *Update 9/21/17 I’ve started buying my cinnamon in bulk because you can get an entire POUND of high-quality organic cinnamon for under $10! Heat medium skillet to medium low heat and add peaches, water, and cinnamon. Cook, stirring occasionally, for 4-6 minutes or until peaches have begun to soften. Serve warm with whipped cream or vanilla ice cream. Have you had any extra delicious peaches this summer? What’s your favorite summer fruit? What do you like to bake with it? Oooh I bet that’d be delicious!! Ooh yes! I didn’t even think about using these for pancakes/waffles/French toast toppings but you’re so right! Yes, we are still eating peaches around here! this post made me want to go to the booth near our house and get more Colorado peaches. 🙂 My dad loves peaches, and I’m sure he would love this. Fresh peaches from a stand beside the road always taste so great! Sounds great Liv! Peach season is the besttt. Going to be so sad when it’s over! I know…I love fall fruits like apples and pears but I’m going to miss peaches and all of the berries! Liv! I’m been LOVING peaches this time of year!! This recipe is perfect! So summery and delicious! YUM! the perfect summer snack. Peaches are my favorite! Just looking at this gave me a sweet tooth! I am definitely going to try these! You’re right, this would be a great way to cover up those little bruises! Do you think this would freeze well after cooking it? Would love to be able to take advantage of the peach season now but also enjoy them later. Looks delicious. Thank you for the recipe. I love how easy this is! i bet coconut cream goes so well with these! i have been wanting to make grilled peaches but these seem even easier! Great idea! I did this but added some frozen blueberries and some sugars. Then starch to thicken tossed a pre-made pie crust on and turned out to be a good pie! Sounds delicious, Angela! Thanks for sharing your version! For the squirrels and other critters, you can use moth balls. When used before the peaches start to change colors, you can mask the scent of the peaches enough that the critters won’t be interested in your tree. We put three moth balls in nylon socks and tie about ten into the tree. You have to keep refreshing them until the peaches are ripe or it won’t be enough to keep them away. It works! We’ve done it for a few years and haven’t had any further issues with squirrels. I’m going to make this recipe tonight for dessert and put it over fresh vanilla bean ice cream. Thanks for the tip, Cynthia! 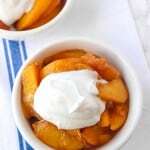 And that fresh vanilla bean ice cream sounds amazing- hope you enjoyed these peaches! Looking very delicious ! ???????????? This making me hungry so much! 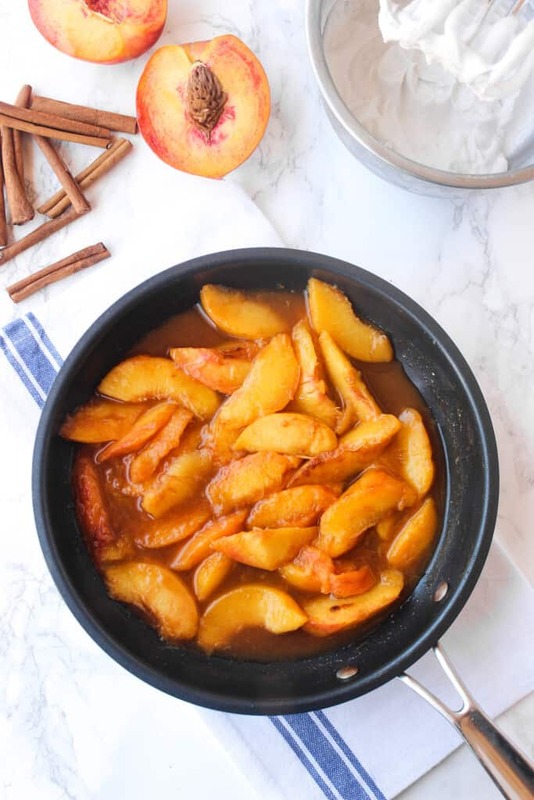 I can’t wait any more to try out to making caramelized skillet peaches ! Thank you many many Liv! Hope you love the recipe, Mira!